Yesterday, I posted about the bones of St. Monnica, the mother of St. Augustine of Hippo. Today we move to the mortal remains of her sainted son. Augustine died on 28 August 430. Sometime before the early 8th century, Augustine’s remains were translated from N. Africa to Sardinia for fear of desecration. It is possible that St. Fulgentius of Ruspe took Augustine’s body to Sardinia. Fulgentius had run afoul of the Arian Vandal overlords in N. Africa and was driven out. If you want to know more about St. Fulgentius, I have a PODCAzT about him. During the 8th century Augustine’s remains were in danger again, but this time by another gang of vandals called Arabs, who were swarming all over the Mediterranean as pirates and brigands. Sometime between 710 and 730 King Liutprand of the Lombards translated Augustine a second time. On some 11 October, Luitprand had him interred in Pavia in the church of San Pietro in Ciel d’Oro. 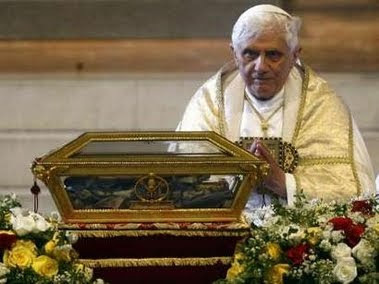 With the passage of time people simply forgot where the saints bones actually physically were in the church. 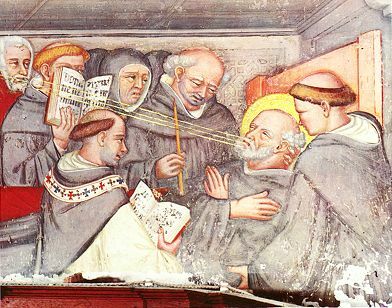 Eventually, the church itself came to be controlled by two different Augustinian groups, the Canons Regular and the Hermits. Let’s just say their relations were strained and leave it at that. Then something happened that set off the war between them. In 1695 a group of workman were excavating under the altar in the crypt of the church. They found a marble box containing human bones. The box apparently had some charcoal markings spelling the part of the word “Augustine”, though those markings disappeared. Great chaos ensued. The memory of just where the relics of Augustine were placed in the church had been lost through the passing of the years. Finding them again set off a rather unedifying battle for their control between the Augustinian Hermits and the Canons Regular. Ultimately, Rome had to step in to resolve things. That’s what Popes do. Pope Benedict XIII, a Dominican who changed his numbering from XIV to XIII so as to avoid counting an anti-pope, got involved personally. He was very interested in saints and canonized the huge number of 18! At least that was a huge number before the pontificate of John Paul II. This was also at the time when the future Pope Benedict XIV, Propsero Lambertini, published his fourth and final volume On the beatification of the servants of God and of the canonization of the blessed. Pope Lambertini would give us the legislation for the canonical processes of canonizations that has lasted with some few changes to today. In any event, Benedict XIII sent a letter to the Bishop of Pavia telling him to get their act together and figure out the questions of authenticity and control. Additional studies were made under someone appointed by Benedict and by 19 September of 1729 things were wrapped up. Processions were held, solemn proclamations made about the authenticity of the relics, a great Te Deum was sung and there was a fireworks display, and anyone who decided to disagree and start the bickering again would be excommunicated. The good ol’ days. The next year under Pope Clement XII the Cardinal Secretary of State (and a patron of the Canons Regular) commissioned the carving of the large main altar with its reliefs, completed in 1738, and which you can see today in the church where Augustine’s tomb is even now. So, when you travel to northern Italy, be sure to stop in the interesting city of Pavia (Pav-EE-a), south of Milan. There you will find the bones of the mighty North African Doctor of the Church, St. Augustine of Hippo. This entry was posted in Saints: Stories & Symbols and tagged St. Augustine of Hippo. Bookmark the permalink.